Today, the public owns 3,100 acres of land in what is called the Scarborough Wildlife Management Area. The marsh is important to southern Maine because it contains some of the most productive wildlife habitat in the region. It also protects against storm damage on the southern Maine coast by absorbing massive amounts of water and energy from winter storms and the occasional hurricane. And it offers a setting of natural, relatively unspoiled beauty that gains in value as sprawl gnaws away at the dwindling supply of open space in Cumberland and York counties. The value of the marsh and its continued vulnerability have prompted conservationists to embark on restoration projects to undo past damage. Participants hope their efforts will protect the marsh in the future, so it will continue to provide benefits to coming generations. 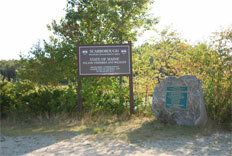 The Scarborough Marsh was born of pressure and ice. Fourteen-thousand years ago a massive sheet of ice that covered Maine began a slow retreat, leaving behind depressed land filled by the rising ocean to the northern shore of Sebago Lake. When the land slowly rose, the water retreated, leaving some areas saturated and protected by barrier beaches. These coastal areas started to build up with pockets of peat about 5,000 years ago. The early marsh probably began as a series of small patches that merged into one large marsh. During the last 5,000 years, sea level has risen 18 feet. The marsh has matched that advance, building itself up with another layer of peat. What makes the marsh appealing to different groups is the richness of its soil and grasses, which create an abundant ecosystem. The only ecosystems containing more life are rain forests. The marsh consists mainly of two types of grass: cord grass, found on the lower banks near the rivers, and salt meadow hay, which grows over the lip of the crumbling banks. Below the grasses the marsh is thick with peat, a saltwater-saturated concoction of the broken-down grasses and other sediments created over thousands of years. 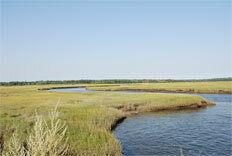 Humans have long been drawn to the marsh, and each group imposed changes. American Indians hunted there and burned some of its grasses. European settlers farmed it for salt hay to feed their cattle. Shipbuilders laid keels at Dunstan Landing, and laborers dug ditches in the marsh during the Great Depression in an effort to eliminate mosquitoes in a mosquito eradication scheme. Another threat to the marsh are invasive plants - especially the fast-growing phragmites. The tall, thin golden plant is most evident where Route 1 cuts through the upper marsh near Anjon's Restaurant. There are two forms of phragmites, a native New England form that does not choke out surrounding habitat, and an import from the Middle East that has wreaked havoc on marshes in mid-Atlantic and southern New England states. Phragmites colonize areas of brackish water with tidal restrictions. The roots race below the ground's surface in straight lines, stalks extending skyward, an army of gold marching in concise rows. Once phragmites secure a foothold, they change the makeup of the marsh by sucking water from the surface and shading out smaller plants. These changes have adverse effects on small invertebrates and fish living on the marsh surface. They also eliminate food sources for birds. For conservationists the goal is not to rid the marsh of phragmites - mainly because it cannot be done completely - but to control the plant. "It's something we are going to have to live with, but we are minimizing their effect," said Rob Bryan, a forest and wetland ecologist with Maine Audubon Society. 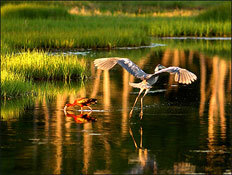 The ongoing threats to the marsh have prompted conservationists to start restoration programs. One of the groups fighting to return the marsh to a more natural state is the Friends of Scarborough Marsh. Friends of Scarborough Marsh will remove the phragmites by applying an aquatic herbicide that, if used properly, is regarded as nontoxic to humans, pets and wildlife. They will then dig the phragmites out by the roots. The project will also hammer down a metal water control structure that impedes tidal flow from a culvert under Pine Point Road.